Have You Ever Eaten Sprouted Bread? Sprouts are seeds that are germinated in water long enough to grow roots, a stem, and tiny underdeveloped leaves. Sprouting usually takes two to three days. Sprouted breads are made from wheat or other grain kernels that are allowed to germinate (sprout), and then ground up and baked or dehydrated into bread. Whole-wheat bread is made by grinding wheat kernels into flour. The wheat kernel include the germ, the endosperm, and the bran. Sprouted-wheat and whole-wheat breads have about the same nutritional value, but spouted bread is usually heavier with a distinct flavor. White bread is made by only grinding the endosperm into flour, removing the germ and bran. White breads are often enriched by the manufacturer with iron and B vitamins, which are lost when the bran and germ are removed. And white flour is usually fortified with folic acid. White breads lack other nutrients, antioxidants, and fiber that was in whole-wheat kernels. Photo of sprouted grain spelt and chia bread by Lifestyle Bakery PTY LTD posted on Wikipedia Commons. 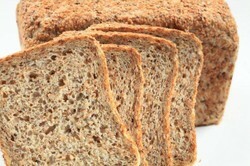 Sprouted grain breads are not produced as much as un-sprouted breads, which make them more expensive to buy. Sprouted breads do not usually have preservatives - so they are usually found in the freezer section in grocery stores. Two bread companies that I know of in the U.S., are "Ezekiel" and "Manna". Although sprouted bread and whole-grain breads are similar nutritionally, many people like sprouted bread for the taste and texture, Since the sprouted-grains are not milled into flour, the bread is more chewy and heavier than regular whole grain bread. And enzymes released during the sprouting process makes sprouted bread easier to digest than other breads. Besides wheat, sprouted and whole-grain breads can also be made from barley, lentil, soy, millet, spelt, rye, oats, chia, flax - practically any grain, legume or seed can be sprouted. And if you don't want to go to the trouble to make your own sprouts, you can buy sprouted flour. Store it in the freezer to keep it fresh. Buy or make a loaf of sprouted bread and see how you like it. If you make your own, experiment and add seeds, nuts, and dried fruit to your bread. Essene bread is also sprouted, but not baked like a regular loaf of bread. Instead, it is dried (dehydrated). Because of the low heat process, this bread still has all its enzymes working, so it's a live food. You can put it in your dehydrator for about 10 hours at 80'F. You can use an oven or small convection toaster oven on a low setting. It can be put out in the sun for 12 hours (make sure you protect it from insects with a mesh cover or screen). You can use a crock pot if it has a low enough temperature. As with any food, there are many ways to make sprouted bread. You can find recipes online or in books. Have You Ever Eaten Sprouts? Yes, I bought them from a store. Yes, and I make my own sprouts. No, I've never tried them. When you buy seeds for sprouting, buy organic seeds. Seeds sold for gardening are often treated with chemicals. All grains, legumes, and seeds can be sprouted as long as they were never heat-treated. Sprouts have high levels of essential nutrients, and usually more nutrients than the mature plants they sprout from. Raw sprouts are supposed to be easier to digest than cooked vegetables. To make sprouts, you need a container that allows water to drain from it. Sprouts that sit in water will rot. A glass jar with a piece of cloth or screen secured over the rim will work. There are also containers you can purchase that allow several "crops" to grow at the same time or on a staggered growing schedule. Rinse your seeds first, then soak them all day or overnight. Read the instructions on the packet of seed to get an estimate of how long to soak them. Don't put too many seeds in your jar; they need room to expand. After the initial soaking, sprouts have to be rinsed and drained several times a day, or they will sour and rot. Each type seed has its own ideal sprouting time. If left longer, the sprouts will begin to develop leaves, and are then known as baby greens. You can stop the growth process by refrigerating until needed. It may take a while to get used to making sprouts, but when you get the hang of it, you'll have fresh sprouts whenever you want them and can sprout varieties not found in supermarkets. I like to use them in salads, in scrambled eggs, and in smoothies. I haven't made sprouted bread yet. We grow it, harvest it, truck it, process it, bag it and get it to you - it never touches a middleman. Identity Preserved - each bag comes with a code you can scan to identify the field we grew it in and harvest date. 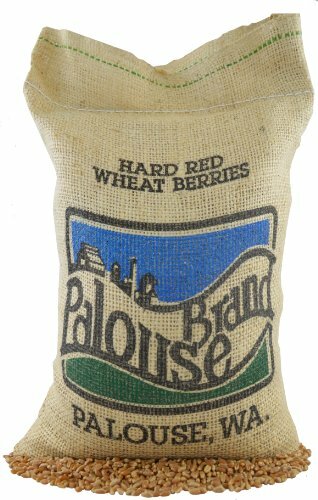 All Palouse Brand products will sprout! 100% whole grain stone-milled flour. Nutty taste. Great for all your baking needs. 100% whole grain stone-milled Millet flour. Can be used alone or mixed with other flours for all your baking needs. What a coincidence. I took my sprouted bread out of the freezer this morning and plan to have toast with melted butter (from grass-fed cows). Angela, Indeed, I am eating a sandwich right at this very moment made from sprouted bread. Thank you. It sounds like we enjoy similar foods. I love sprouted bread, I eat Ezekiel 4:9 bread everyday, well almost everyday. I also make my own bread but never sprouted my own sprouts. I enjoyed learning how to make my own sprouts here, great and easy tutorial. I used to buy containers of sprouts at the market all the time until the scare of contamination. All the more reason to sprout seeds at home. I pride myself on making many living foods myself and so why not this. I don't know how I've missed your wonderful and helpful life articles but am certainly glad I lifted my head from my busy workaholic life and took a breath. Love your work. I eat sprouted bread a lot. It does not seem to bother me, as other wholegrain breads can. White bread is simply out of the question! happynutritionist - I like sourdough bread, too. The only bread we eat is Ezekiel bread. I have never made my own sprouted bread however. Mira, mold grows in moist, still air. If it is greyish mold it could be botrytis or one of the many kinds of mildew. Whichever it is the remedy is the same To avoid it, ensure that you have a good airflow in your flat. You can spray with an antifungal spray to prevent it, but if you get the mold, destroy the plant by burning. Disinfect any pots that have been infected with mold. Mira - I hope you can find some. If not, you can try making it, although it does take time. You can find a lot of recipes and directions online, or in books about breads and raw foods. Have You Ever Eaten Sunchokes / Jerusalem Artichokes? Sourdough is an American term for bread that is made from a starter (culture) of wild natural yeast; not from modernized yeast found in grocery stores. Sunchokes, also called Jerusalem artichokes, look something like ginger roots but are more rounded. They have a sweet, nutty flavor and the texture is firm and crisp.